Our Mission : To Provide Personalized & Best Holiday Travel Package Tours to Promote Tourism In Himachal & North India. Himachal Pradesh is one of the most scenic places in world, also known as Switzerland of India. It is full of hill stations, adventures sports destinations, festivals and celebrations, and wildlife. Himachal Pradesh Tourism attracts wide range tourist traffic to the hill destinations. Himachal is one of the few places in the whole world with five seasons. Spring, summer, the monsoon, autumn and winter. Himachal Pradesh is known as Dev Bhumi (The Abode of Gods) as it has more than 2000 temples & holy places.The prominent & famous temples in Himachal Pradesh are Jwalamukhi Devi, Brajeshwari ( Kangra) Devi, Chintpurni Devi and Naina Devi. There are fascinating legends associated with these shrines, the most popular of them being that of King Daksh of Himachal. The story goes that the arrogant king did not invite Lord Shiva, his son-in-law to a 'yagna', and consequently his daughter Sati, utterly humiliated, plunged into the sacrificial fire. Shiva arrived on hearing this, only to find his beloved half burnt. Enraged he carried her charred body and broke into the 'tandava nritya', the awesome dance of death. Her charred remains - tongue, breasts, feet and eyes fell at four places to form the four pilgrimage sites of Jwalamukhi, Brajeshwari, Chintpurni and Naina Devi. This temple circuit is one of the most popular ones in North India. In addition Other famous pilgrimages in Himachal Include "Mani Mahesh Kailash Yatra", Baba BalakNath Siddh peeth, Chamunda Devi temple etc. In the north of Himachal is state of Jammu & Kashmir. 2. 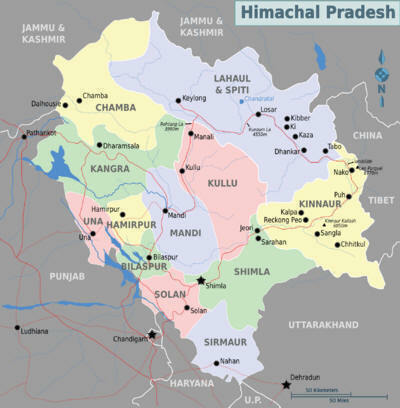 Area of Himachal Pradesh is 55,700 sq kms and population approx. 6 million. Altitude ranging from 350m to 7000m. Best Time to Visit - April to October. Best Time to Visit- All through the Year. Adventure Options- Trekking to the various Villages on the way to the Pass. Pin Parbati Pass - At a height of 14000 ft above sea level, Pin Parbati Pass is an ideal and one of the most strenuous trekking trail in Himachal Pradesh. The trek at the pass will take you around some of the best natural attractions. Great Himalayan National Park and Pin Valley National Park can be visited during this trek and if luck favours, tourists can site snow leopards and rare birds like Western Tragopan. The remotely located monasteries are the best places to unwind after a long trek at the Pin Parbati pass. Adventure Options- 13 Day Trek from Manikar to Manali. Finish: Luhri (Hindustan-Tibet Road; NH 22). Lower Himalayas – Shivalik Ranges – Lower Kangra,Una, Bilaspur, Hamirpur, Solan, Sirmaur etc are part of this range. Satluj River – Originates in the base of Mount Kailash and flows in Tibet for approx. 300kms before entering india. Bhakhra Dam is made on the satluj river in Bilaspur Distt. Ravi River – Originates in Dhauladhar, Flows through Chamba and Dalhousie and enters Punjab. Lahaul Valley Himachal Pradesh ( Located in Lahaul Spiti – major Destinations are Keylong, Jispa). 80% of agriculture is done on Terraced fields with high slopes. Cash crops – potatoes, mushrooms,ginger, tea. Himachal known as Apple state of India, other fruits include Pears, Peaches, Plums, Cherries, Apricots, walnuts. Sub tropical zone has trees like Sal, Laburnum with yellow flowers. Other trees include Pine, Spruce, Cypress,Fir, Horse chestnut. Guchi (Morel) is a delicacy grows in wild and exported all over the world. Bhots, Kinners, Lahauls, Gujjars, Gaddis came from Tibet slowly and gradually settled in himachal Pradesh. During Mahabharat time, Himachal Pradesh consists of many small republics also known as janpads. These Janpad had independent political and cultural units. Chandragupta – The Mauryan king ( 322BC) allied with Trigartha chief, up to 3 generations including his grandson Ashoka’s rule, most of Himachal Pradesh sore allegiance to Mauryan Dynasty. After fall of Mauryan empire, Kushan emperors were in command of himachal Pradesh till 2ndBC. After Kushan empire, Guptas took over the reins of Himachal Pradesh. Between 4thand 7thAD centuries old republics of Andumbara, Trigarta and Kulinda submitted to rulers of Chamba and Bushhar. Entire Himachal Pradesh came undr the rule of Mughals when Jahangir army defeated Katoch rulers of Himachal. The Mughal rule lasted for 160 years. After Mughals, Sikhs took over many parts of Himachal Pradesh during 18thcentury. Sikhs were defeated by Gurkha army led by amar singh thapa. The Kangra fort was held against gurkhas for 4 years, the ruler Raja sansar chand of kangra sough the help of maharaja Ranjeet singh and sikh army succeded in pushing out gurkhas. After maharaja Ranjeet singh’s death in 1839, states of Kangra, Nurpur, Guler, Mandi , kullu, Lahaul, Spiti came under direct control of British. Other tourist attractions of Dharamsala are St. John'S Church In Wilderness on way to McLeodganj, Chamunda Devi Temple, Maharana Pratap Sagar (Wild Life Sanctuary), Norbulinka Institute, Nurpur Fort, Dall Lake, etc. A visit to Himachal Pradesh offers a complete range to tourists, From beautiful hill-stations, Holy temples, unique festivals, exotic wildlife, thrilling adventure sports, trekking, breath stealing natural beauty, age old culture and heritage there is much to see and experience that attracts everyone. The climate of Himachal varies from hot and sub-humid tropical in the southern tracts to cold, alpine and glacial in the northern and eastern mountain ranges with more elevation.The state has areas like Dharamsala that receive very heavy rainfall, as well as those like Lahaul and Spiti that are cold and almost rainless. Broadly Himachal experience three seasons; hot weather season, cold weather season and rainy season. Summer lasts from mid April till the end of June and most parts become very hot (except in alpine zone which experience mild summer) with the average temperature ranging from 28 °C (82 °F) to 32 °C (90 °F). Winter lasts from late November till mid March. Snowfall is common in alpine tracts (generally above 2,200 metres (7,218 ft) i.e. in the Higher and Trans-Himalayan region). Himachal Pradesh is divided into 12 districts namely, Kangra, Hamirpur, Mandi, Bilaspur, Una, Chamba, Lahul and Spiti, Sirmaur, Kinnaur, Kullu, Solan and Shimla. The state capital is Shimla which was formerly British India's summer capital under the name Simla. Himachal has small airports in Shimla, Kullu and Kangra. There are scheduled flights from New Delhi to Himachal Pradesh Towns. Himachal has few stations connected by the train Network. Una Himachal is the Only Broad Gauge railway station to Himachal. ( We are based in Una Himachal) . Una works as a main gateway for Himachal for various travelers, tourists, Pilgrims. Presently there are two main trains terminating in UNA. Himachal Express/14553 - Arrival time in UNA at 07:50AM ( Every Day).